Does going out of your way to upgrade your business’ siding making any sort of hard cents sense, business-wise? At first glance, you might be tempted to dismiss the idea out of hand; after all, making sure that the roof and doors and similar essentials are sound is more important, right? But have you considered that your building’s siding may just as easily be as important as your building’s roof, walls, doors, and whatnot? 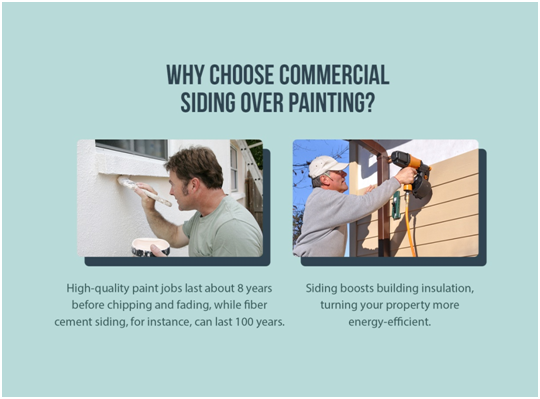 While it’s easy to mistake siding as little more than decorative sheathing for your building, the fact is that, aside from the obvious aesthetic effect of pretty new siding, there are a lot of functional reasons for keeping your building’s siding in good shape. 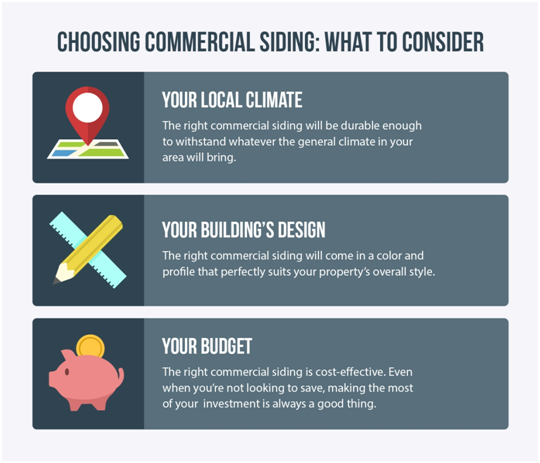 For one thing, siding is often a good way to add insulation to your building, beyond whatever insulating material you already have in the building’s structure. You may not think it, but every little bit of insulation helps, especially if you have to spend on heating and cooling to maintain the temperature and environment within your building. Your building’s level of insulation helps to prevent the transfer of heat between the outside environment and your building’s temperature-controlled interior. This translates into a reduction in your overall heating and cooling costs over the course of the year. All that, and it’s pretty, too. 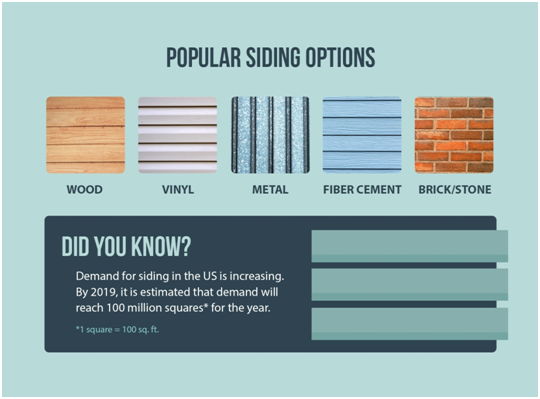 Functionality aside, the ability of siding to soften the look of your building and enhance its aesthetic and curb appeal is one of the reasons the demand for siding is only increasing in the United States. 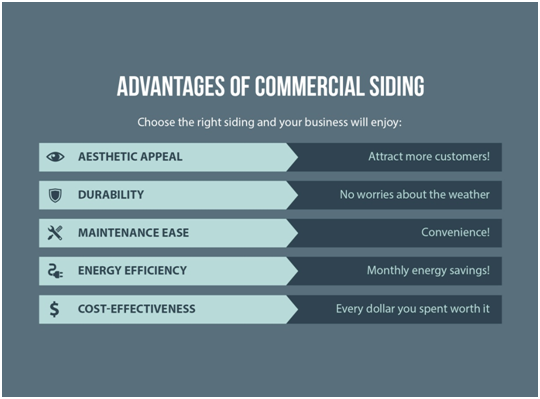 The different types of siding available — whether it’s the traditional elegance of wood, the familiar look of vinyl, the utilitarian aesthetic of metal, the particular look and feel of fiber cement, or the sense of solidity that comes with stone or brick — all contribute in a positive way to your building’s appearance, which can help attract more customers. That said, not all siding types are for everyone. Or, to be more accurate, for every business.Certain factors affect, and can effectively determine, the particular siding types that you can (or should) install on your building. Your local climate is one of the more important considerations. If your building is located near the sea, for example, then you’ll probably want to avoid wooden siding; the salt air and the high moisture levels can work horrors on what would otherwise be a beautiful layer of siding — in this case, if you really want to go with the look of wood, you might want to go with fiber cement instead. Your building’s design aesthetic and particular architectural type also plays a part in what siding goes well with it. Buildings with a sleek, modern look benefit from the clean lines of metal or vinyl siding, which can only enhance the look and feel of the building. Those built towards a more traditional aesthetic, though — maybe you run an old-fashioned inn or something similar? — often do better with wood, brick, or stone siding, which helps to enhance that homey, old-world atmosphere. 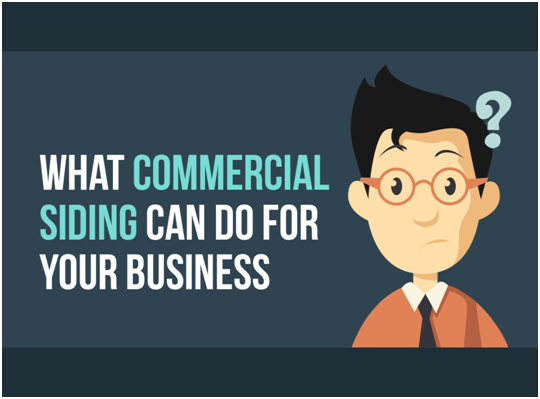 Why Choose Commercial Siding Over Painting? If you’re mostly concerned about your boosting your building’s aesthetic appeal, you might think it might be simpler to just go with a coat of paint instead of going through the siding replacement or installation process. However, how long do you want to carry out maintenance to keep your building looking good? At best, even a professional paint job will last somewhere around 8 years or so; at that point, you’re bound to notice the chipping and fading. Before you can even do anything about it, though, you’re going to have to strip off all the old paint before you can apply a new coat. At best, you’ll only have to do that for a small area, but you could easily be looking at having to strip away and clean up old paint from your building’s entire facade. Instead of having to go through that periodically, why not just invest in a good layer of siding? The best siding products on the market today typically offer a wide variety of colorfast hues and tints straight from the factory. Long after a paint job will have started to fade and crack and peel, commercial siding will still be looking as good as new. 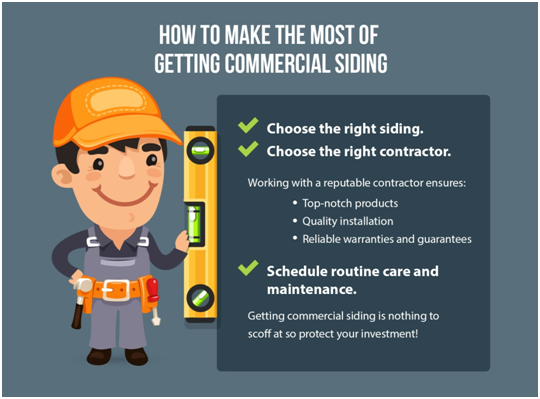 Making the most of your investment means finding the right commercial siding for your business and working with the right contractor to ensure quality installation.If you’re still not sure about going out and buying new siding for your building, don’t hesitate to consult with your local siding expert. Steve Rumpf is the founder and owner of Erin Isle Construction. For more than 25 years now, he’s been contributing his knowledge and expertise in design and installation toward the improvement of local homes and commercial properties in Portland and other nearby areas. For updates from Steve, check out the company blog! Previous ArticleWhat Do I Have to Do to Get a Buy-to-Let Mortgage? Should I Replace The Roof Before Selling My House?